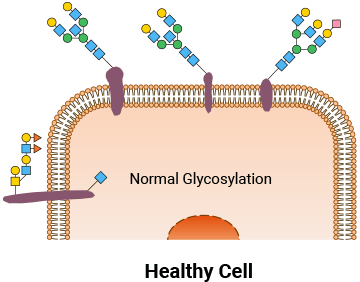 Glycans and Disease | GlyTech, Inc.
Glycans are involved in disease in various ways. Bacteria and viruses use glycans to recognize and attack the cells of their host. One example is the influenza virus, which uses its surface glycoproteins to attach itself to certain glycans on the surface of cells in the lining of the nose, throat and lungs so that it can invade. After multiplying within a cell, the new viruses bud off from its surface and infect new cells. Influenza virus binds to glycan (sialic acid) molecules on the surface of host cells. 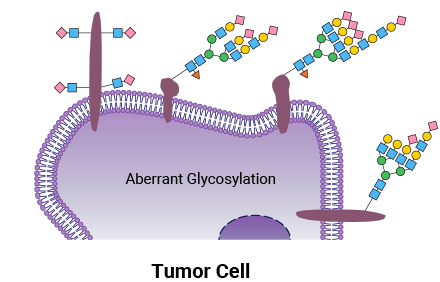 In tumors, cancer cells often make and display abnormal and incorrect amounts of natural glycans. This behavior could be targeted with new diagnostics and therapies. Healthy cells and tumor cells show obvious differences in their surface glycans. Because glycans are vital to cell-cell interactions and communication, glycans also control the behavior of the immune system in many different ways. Glycans are one indicator of whether cells or proteins belong to the body. Foreign glycan structures and patterns are recognized by the immune system as “non-self” and activate an immune response. Conversely, the presence of “self” glycans can act as a signal to prevent the immune system from over-reacting. Glycans are also essential components of antibodies, which bind to pathogens and infected cells and either neutralize them or tag them for removal by white blood cells. Differences in glycan structure can change the target, binding ability and activity of an antibody. As a result of these functions, the formation of incorrect glycan structures or patterns in either the immune system or in the rest of the body can cause autoimmune disease. Much progress is being made in the development of new medicines and therapeutics based on the numerous roles of glycans in disease.